Indian Institute of Technology (IIT), Roorkee has released an advertisement for filling up post of Senior Research Fellow (SRF) & Junior Research Fellow (JRF). The engagement is purely project based temporary recruitment. A Walk-In-Interview will be conducted on 12 April 2017 at Indian Institute of Technology (IIT), Roorkee. Senior Research Fellow Candidate must have Master Degree in Agro meteorology, Soil Science, Agronomy OR M.Tech in relevant dicipline with two year of research experience Rs. 25,000/- p.m. Junior Research Fellow Candidate must have Master Degree in Agro meteorology, Soil Science, Agronomy OR M.Tech in relevant dicipline Rs. 25,000/p.m. Screening of candidate will be done on the basis of performance in the walk-in-interview conducted in the Indian Institute of Technology (IIT). Candidates may appear in the walk-in along with a copy of their application with CV (including educational qualification, experience, contact address, phone no., e-mail etc.) to DR. G. S. Randhawa, Department of Biotechnology on 12 April 2017. 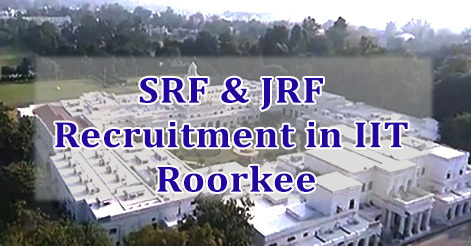 Help us to improve this article/job posting "SRF & JRF Recruitment in IIT Roorkee". We would be glad if you can comment below and provide your valuable suggestions and feedback. If this page have any wrong information/list or out of context content, then you can report us as well.